This weekend is looking busy but kind of conventional after the supercharged diversity of last Saturday and Sunday. Then we had to deal with everyone from fishwives to film stars and birthday queens, as well as the usual brides and grooms. It was action packed, there were loads of happy faces and I managed not to run over James Norton in 1930s London, aka a heavily costumed Moray Place, Edinburgh. It was interesting for The Red Bus to be involved, along with a convoy of seven or eight old cars. The film is about Gareth Jones, the Welsh journalist who exposed the horrors of Stalin's mass famine in the Ukraine and was himself murdered in the Far East, possibly on the Soviet dictator's orders. He is being played by Norton, who had to cross the road in front of the bus. Again and again. And again. I think we did about 12 takes of the traffic scene. Some of the poor extras standing around on the pavement were getting very cold in the haar after hours of this! The makeup department also had to give me an impromptu haircut on someone's doorstep as my locks were too unruly for a 1930s bus driver. 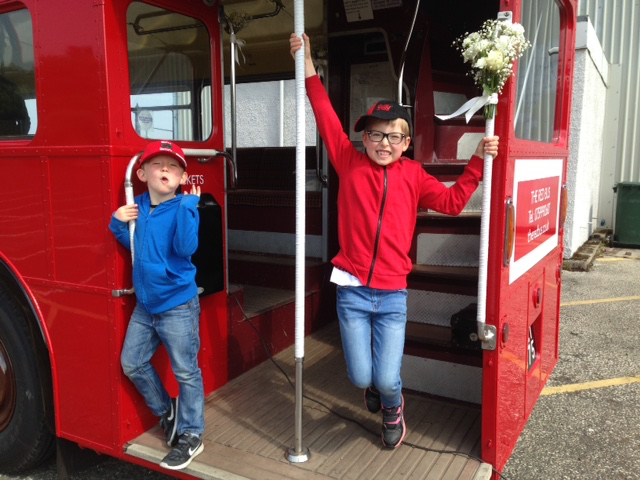 It was a joy to drive RM737 at the annual Cockenzie and Port Seton Gala too, in the 70th year of the event. About half the Gala Queens going back to 1948 were on board as we processed in sunshine through the streets of the East Lothian coastal towns. They were lined with cheering locals and decked with bunting. "Fishwives" carrying big baskets handed out small gifts ahead of the bus. Back at Granton a Welsh bride-to-be checked out the buses for her wedding plans. Her boys seemed to like it! Oh, last weekend we also had two weddings and a 50th birthday party tour. Like I say, it was a fair bit of variety. (c) Copyright The Red Bus 2018. All rights reserved. Website created by Briony Cullin.